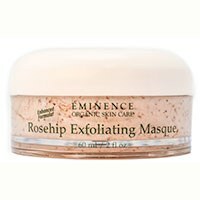 Removes impurities while calming and soothing sensitive skin. It helps clear and cleanse the pores while calming, hydrating, and soothing the skin at the same time. The gentle exfoliating properties of Maize Flour removes dead skin cells without damaging the delicate skin. Ingredients:Rosehip, Rosehip Juice, Corn Extract, Zinc Oxide, Corn Germ Oil, Bioflavonoids, Honey, Corn Granules, Natural Moisturizing Factor, Hydroxyethylcellulose, Natural Cream Base, Biocomplex (Vitamin A, Esther C, Vitamin E, Coenzyme Q10, Alpha Lipoic Acid), Xanthan Gum, Lemon Oil, Mint Oil, Glycerine, Glycine Derivative.